• The Model 5211 is the workhorse of the GoJak® auto jack / dolly product line. 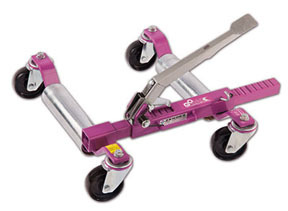 • The basic self-loading dolly design was developed twenty years ago and the specifications have recently been improved from 5,000 to 5,200 lb capacity. • The 5211 Series GoJak® is a proven and reliable product that can lift and move wheel weights up to 1,300 lbs. (up to 5,200 lbs with four units). • Capable of lifting tire widths up to 11 inches wide and up to 34 inches tall, the unit accommodates a very large percentage of the passenger cars and small trucks sold today. • It uses a bi-directional linear ratchet for the jack portion and four 4-inch diameter heavy-duty doubleball raceway casters. • This is the right hand unit. GoJak 2006-B56 Black Caster Assy. 4"
DJS Fabrications, Inc. 00107 Frame Machine Plates "Chief Style"